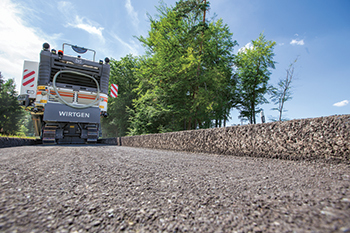 The quality of the milled surface has a major impact on the uniformity and success of a road rehabilitation project, says the Germany-based Wirtgen which claims to offer the most extensive and innovative line-up of cold milling machines in the industry. “An evenly milled surface, true to line and level, is a crucial factor when it comes to paving surface courses of uniform thickness and avoiding costly correction measures in the form of asphalt levelling courses,” he adds. Wirtgen offers a choice of more than 30 different machine types, each available in varying milling widths, ranging from 14 mm to 4.4 m.
The lower performance class starts with the small 45-kW milling machines and extends through compact machines with engine outputs of between 257 and 298 kW, to large milling machines in the upper performance class offering power reserves of up to 753 kW. A decisive factor in milling a quality surface is precision levelling. It is standard practice in the field to copy an existing surface by scanning a reference line. Equipped with a wide range of sensors, the Wirtgen Multiplex levelling system can do much more than simple copy. Three sensors on each side of the machine scan the height at wide intervals along the same reference line. “The automatic levelling system averages the three measurements to create a perfectly even milled surface, while meeting the target milling depth. This is a highly effective way of levelling out longitudinal undulations. What is more, defined surface profiles can be created, such as specified cross slopes or crowns,” he explains. Completely new surface profiles can be created by means of 3D milling. A new digital surface profile generated on the computer can be transferred directly to the Wirtgen cold milling machine using 3D levelling systems. Increased quality and cost-effectiveness are major benefits offered by 3D milling technology. To achieve optimum results, the levelling parameters for the respective machine are saved, linked to the Level Pro automatic levelling system and retrieved during the working process. Nowadays, the widest variety of pavement layers are removed and separated in highly selective processes. The removal of problematic construction materials is possible, as is the standard separation of premium-quality surface courses with a high bitumen content, or the removal of road markings prior to the actual separate milling of the asphalt courses. The surface, binder and base courses can be returned separately to the material cycle, increasing the sustainability of RAP (recycled asphalt pavement) recycling. Holl also points out that selective milling does not necessarily have to be a time-intensive process. Modern cold milling machines have been specifically tuned to typical selective milling. Hence, milling off surfaces in two or three layers can sometimes be just as fast – in some cases even faster – than complete pavement removal, depending on the type of machine and pavement and on ambient conditions. Due to the shallower milling depth, the cold milling machines work more quickly when removing the individual layers than when removing the complete pavement at maximum milling depth in a single pass. The powerful “heart” of the cold milling machine – the milling drum assembly with all the cutting technology components – also has a critical bearing on the quality, costs and performance of the milling process. Here too, as a technology leader, Wirtgen is continually developing cost-efficient solutions. Different milling drums support a wide range of milling applications on different road surfaces.